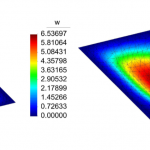 Meshfree methods have several attributes that make them attractive for simulation in mechanics. Two important ones are summarized as follows. The meshfree approximation is independent of the definition of a finite element mesh — the approximation is constructed based solely on nodal locations. This feature makes meshfree methods more appealing for the discretization of field variables in problems where, for instance, mesh distortions introduce a limitation for finite elements. Another attribute is that they are typically more accurate than finite elements. This is a consequence of the support size of the meshfree basis functions that span the approximation. Usually, more nodes are covered by the support of a meshfree basis function than the support of a finite element basis function. Hence, the meshfree approximation is better than the finite element interpolation because more data enter in the meshfree approximation of a field variable at a given location in the domain. Nonetheless, the flexibility provided by the aforementioned attributes has its downsides. For instance, moving least- squares and maximum-entropy meshfree basis functions are obtained from the solution to an optimization problem. On the contrary, finite element shape functions are computed from simple formulas that depend on the element shape. Additionally, there is one important drawback in meshfree Galerkin methods: they require numerical integration of the weak form integrals, which if not performed appropriately, may lead to inaccuracies and suboptimal convergence. Meshfree Galerkin methods are built from a weak form and thus require numerical integration to evaluate the weak form integrals. 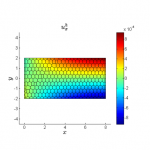 One approach for numerical integration is obtained by constructing non-overlapping background integration cells on which Gauss integration is performed (cell-based integration). Typically, this process is done by constructing a finite element mesh that is used twofold: to obtain the nodal coordinates for the meshfree basis function computation and to obtain integration cells. Another approach to numerically integrate the weak form integrals is by using the nodes as integration points (nodal integration or node-based integration). In this integration method, a Voronoi tessellation is constructed from the nodal discretization to form polygonal/polyhedral cells that are used as representative volumes for the nodal integration points. In meshfree Galerkin methods, cell-based integration (as defined above) is not exact and thus introduces large integration errors that can compromise the consistency, optimal convergence, and even stability of the numerical solution. The consistency is the ability of an approximation to exactly reproduce a given polynomial when the exact solution is the given polynomial. If integration errors are present, the consistency property is lost and patch test is not passed. These integration errors also result in rank deficiency of the stiffness matrix leading to stability issues. Integration errors can be alleviated in part by using high-order Gauss integration rules, but this is undesirable because the method becomes very expensive and in three dimensions is untractable. In node-based integration methods, the number of integration points is reduced to the number of nodes, which represents a strong advantage over cell-based integration methods. 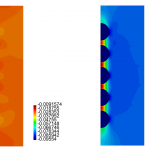 However, node-based integration methods, if not treated properly, suffer from instabilities. Therefore, the robustness of meshfree Galerkin methods is quite dependent on the numerical integration procedure and can still be enhanced if improved numerical integration schemes are developed. Within the context of solid mechanics simulations, herein it is proposed to devise improved cell-based and node-based integration schemes for meshfree Galerkin methods that result in consistent, stable and optimally convergent solutions on arbitrary background integration meshes, which include classical finite elements and arbitrary polytopes. 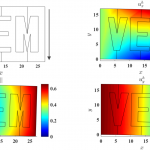 An elegant way to achieve this aim is offered by the recently proposed virtual element method (VEM), where the stiffness matrix is decomposed into two parts: a consistent stiffness that reproduces a given polynomial space and a correction stiffness that provides stability. Such decomposition (herein referred to as the virtual element decomposition) is formulated in the spirit of the Lax equivalence theorem (consistency + stability → convergence) for finite-difference schemes. 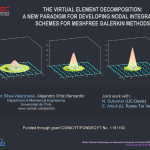 Hence, this project proposes to combine meshfree methods with the virtual element decomposition to tackle the numerical integration issue in meshfree Galerkin methods. This work has already been initiated by this proposal’s author and an article is already published. Therein, the effectiveness of the virtual element framework to tackle the integration issue in meshfree Galerkin methods has been proved for the Poisson and linear elastostatic problems. The present proposal seeks to continue this work. It is expected that the robustness of meshfree Galerkin methods such as the element-free Galerkin method and the maximum-entropy meshfree method will be vastly enhanced by these new numerical integration schemes based on the virtual element decomposition. The impact of this project is ample. Metal forming processes, crashworthiness in the automotive industry, kinematic response of soft biological tissues, surgical simulations in computer aided medicine, and extreme events such as explosions and landslides are some of the potential applications in which robust meshfree Galerkin methods can be of great benefit.